Children on the move (CoM) refers to a broad category of children that move within or between countries for a variety of reasons. The movement may or may not be voluntary. Children on the move may be seeking employment and educational opportunities, escaping war and political violence, seeking reunification with family, or being forcibly trafficked. They travel alone or with family members, and may be classified as refugees, internally displaced persons, unaccompanied children/minors, and voluntary migrants. 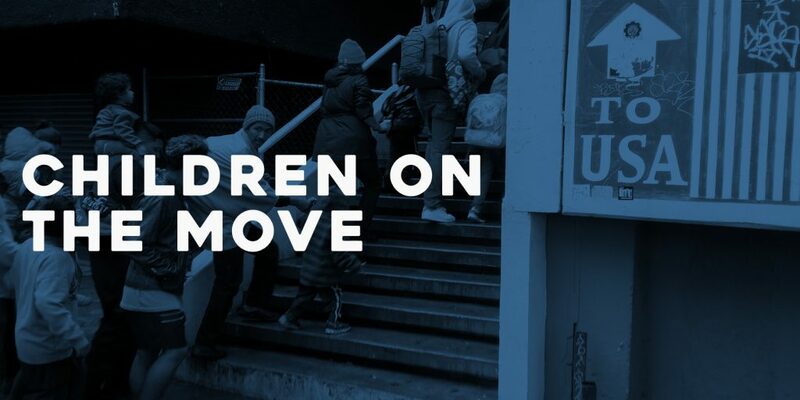 Our Children on the Move program seeks to influence the development of legal, social, cultural, and educational policies directly affecting children on the move. Insofar as the policies enforce human rights and have implications for social justice, integration, and child protection, they will also benefit those whose lives intersect with migrant children in origin, transit, and destination states. See the report Children on the Move: An Urgent Human Rights and Child Protection Priority (November 2016) (download in its entirety here, the table of contents only, or individual sections later on this page). The dominant approach to conflict prevention, migration and child protection/welfare — both policy and practice — in Europe, Africa, and Asia is siloed and incomplete. A second goal of the project is to replace this approach with rights respecting measures for CoM across national borders and within countries. We also aim to promote systemic approaches to enforce the rights and wellbeing of children and young people affected by migration and who are at risk of violence, exploitation, marginalization, and deprivation. We are undertaking two comprehensive reviews. One, a framing review, considers current legal and policy approaches to CoM. The other, a learning review, deals with sexual abuse and exploitation of CoM. The reviews are informed and supplemented by seven cases that illustrate the risks faced by CoM in different contexts and the need for more comprehensive policies and programs to protect this population. The framing review outlines international, regional and national legislation, as well as guidelines and procedures covering children who move whether for family, survival, exploitation, or mixed reasons. It makes recommendations for a more comprehensive approach that recognizes and implements children’s right to basic services regardless of immigration or documentation status. It also recommends that children on the move not be discriminated against or criminalized. The CoM learning review explores current knowledge about sexual abuse and exploitation of children on the move. It considers risk factors prior to the start of migration, in the child’s home or previous environment, during the various phases of the migration journey, and then during the multiple stages of arrival, resettlement, and integration or assimilation. The review documents the impact of a range of elements on the probability of exposure to sexual exploitation and abuse. Risk amplifiers include: (a) poverty and other inequalities, (b) gender-based discrimination and violence, (c) armed conflicts and political violence, (d) insufficient educational opportunities, (e) disruption of family systems, and (f) demographic shifts to an increasingly youth-dominated population. Living Rough: On the Street in Senegal.